When you stay at Beit Nurit in Gilon, you'll be near the beach and within the vicinity of Doha Stadium and Yehi'am Fortress National Park. Featured amenities include multilingual staff and laundry facilities. Free self parking is available onsite. With a stay at Gan Hamlachim in Amirim, you'll be 10.5 mi (16.8 km) from Ziv Medical Center and 10.5 mi (16.9 km) from Otzar Hastam of Tzfat. Free self parking is available onsite. Located in Tel Aviv (Tel Aviv Promenade), Blue Sea Marble is within a 15-minute walk of Frishman Beach and Gordon Beach. 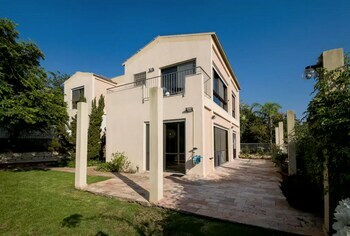 Located in Tel Aviv, TLVilla Guesthouse is minutes from Habima Theatre and Culture Palace. Featured amenities include complimentary wired Internet access and laundry facilities.